Objective: A major metropolitan hospital had completely renovated and expanded their maternity wing, and was looking for a going home gift for new mothers leaving the hospital. The hospitals wanted something memorable and lasting for the mother, yet have the hospital name prominently displayed. They also wanted the item to be timeless so they could continue to present the item to new mothers through the years. 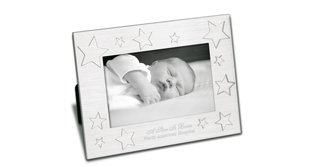 Strategy: The distributor presented the IMC ‘Constellation’ frame with its embossed and debossed stars, and proposed it to the company with the idea that “A Star is Born.” They further proposed that the hospital insert a picture of the baby before presenting it to the mother. Result: The hospital loved the concept and began presenting the frames soon after receiving their first shipment. It quickly became a ceremonial tradition as the nurse would gather around and watch the mother’s eyes well up with tears of joy as they saw their baby in the beautifully starred frame.